Our business clients range from small closely-held corporations to LLCs formed to own real property, as well as larger enterprises requiring complex equity structures and financing. We counsel these clients in choosing the form of business entity most appropriate for their needs, using a team effort between the business client, the lawyer and the client's accountant. We routinely work closely with our clients' accountants to resolve a variety of issues in forming a new business entity, such as the valuation of intangibles contributed for stock and the tax consequences of making an "S" election or choosing another "flow-through" entity. 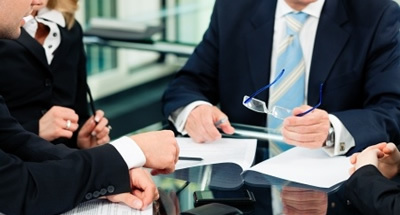 We also provide businesses with ongoing legal support for their corporate governance, as well as their transactional needs on such issues as buy-sell agreements, leases, debt instruments and security agreements, protection of intellectual property assets, structuring equity investments and incentive plans, securities law compliance, employment and labor issues, sales of business assets, and mergers and acquisitions.